IT’S FUN TO GROW YOUR OWN VEGETABLES AND FLOWERS. EVEN IF YOU DON’T HAVE YOUR OWN GARDEN OUTDOORS, YOU CAN ALWAYS CREATE ONE NEXT TO YOUR DOLL’S HOUSE. There are many ways of growing a miniature garden for your doll’s house. 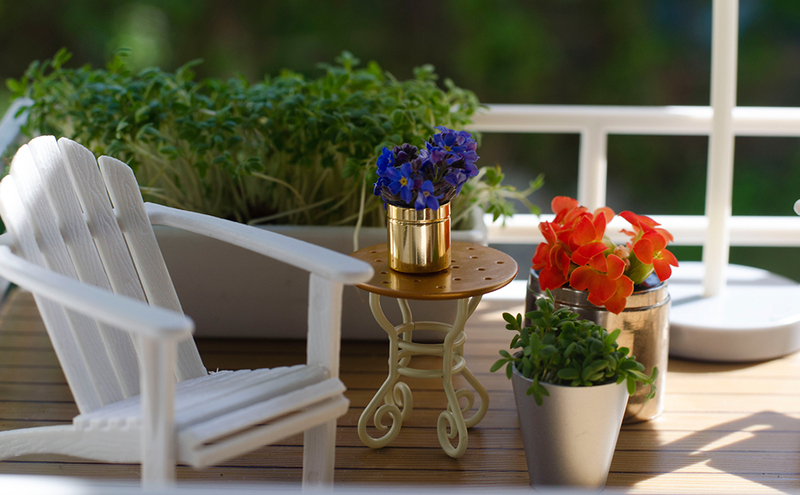 Small pots of mini violas go nicely with your garden furniture, and you can also put pots of cress in the garden, on the balcony or even in the living room, if you want to have a little greenery indoors. If you’re a little impatient, cress is a good choice because it grows quickly! There are lots of pretty toy flowers you can buy for your doll’s house, but it’s always nice to grow real ones during the summer – if you’re really good at looking after them you can keep your house nice and green all summer long. It’s good to water your flowers of course, but make sure you always take the pots out of the house first, because you can’t have water in your doll’s house. IF water gets into the house, the wallpaper, floors and furniture could be damaged. You can either use flowerpots from the Lundby range, egg cups without a base or the tops from bottles of perfume/aftershave or nail varnish (make sure you ask your parents before borrowing these!). All these will make fine flowerpots for your flowers. You’ll also need a little soil, and some seeds. Cress is easiest to grow, and the perfect size for your dolls. Other pretty flowers in the right size include mini violas, bridal veils and lobelias, and don’t forget wild strawberries – they’re like giant strawberries for your dolls! Get help from an adult when planting, this’ll make it more fun!